"It Ain't Easy Being Green, Part 2"
We're traveling through another dimension, a dimension not only of cancelled books but announced reboots. A journey into a baffling land where dead volumes yet continue just to kill time. That's the signpost up ahead - our next stop, The Lame Duck Zone! Looks like this volume is coming to its conclusion... and yet, it must continue for the interim. Nothing says "these stories matter" more than watching a title limp across the finish line... while charging us four-bucks a pop to come along for the ride! 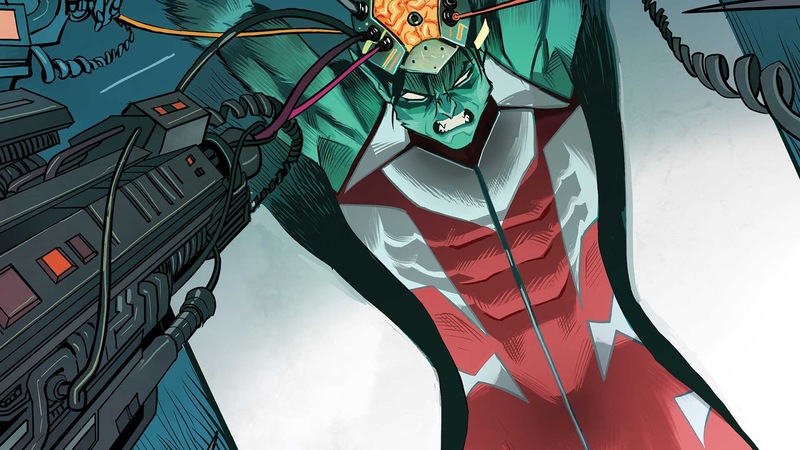 Beast Boy's story continues... hopped up on "Pixie", everything seems cool. While "under the influence" he relives a fun-house mirror version of his origin story, in which everything ends up okay. The green monkey that bit/scratched him in "real life" missed him by inches when his father yanked him out of the way. Back at (the still smoldering) Titans Tower, the gang (and us) learn that these Nevrlanders are actually a "start-up"... I mean, that's something "kids these days" think is cool, right? They get by with this weird stuff called "bitcoin" and they operate on the "dark web"... hey, that's a lot of things that "kids these days" might know about! Gar and his new half-a-haircut-having pal bond over their experience and are able to organize a full-blown public event to properly launch their "start-up". I assumed this is supposed to be an "underground" sort of operation... I mean, they're selling an inhalable syringe that injects a microchip into your prefrontal cortex... I think the A.M.A. might take issue with that sort of thing. Also, these kids who show up for the presentation... they're more than happy to snort the stuff at the word "go"! I mean, I think "kids these days" might be more susceptible to suggestion, but this is ridiculous! We end on a cliffhanger, because this story... must continue. I know I've given this title a lot of guff in my time reviewing it... and at this point, it's not even fun anymore. I feel like I'm picking on a book that can't defend itself. Fact is, whether DC realizes it or not, this twice-monthly/monthly shipping deal since Rebirth puts these books into a sort of "pecking order". Teen Titans, being a "monthly" already feels like an afterthought. Add to that the glacial pace/treading water this volume has gone for the past eighteen months... and we've got something that is extremely hard to get excited for. 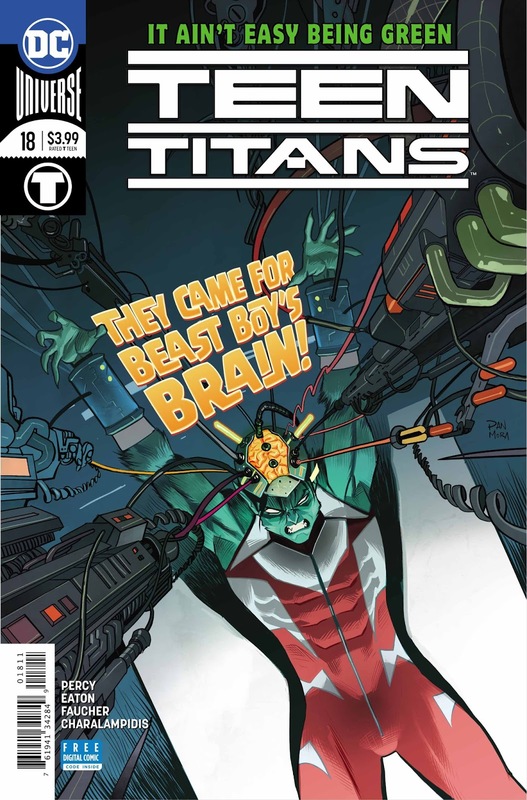 Bad, in that... this entire volume will go down as one of the more pointless volumes for the Teen Titans. Sadly, that's a pretty low bar to duck under. 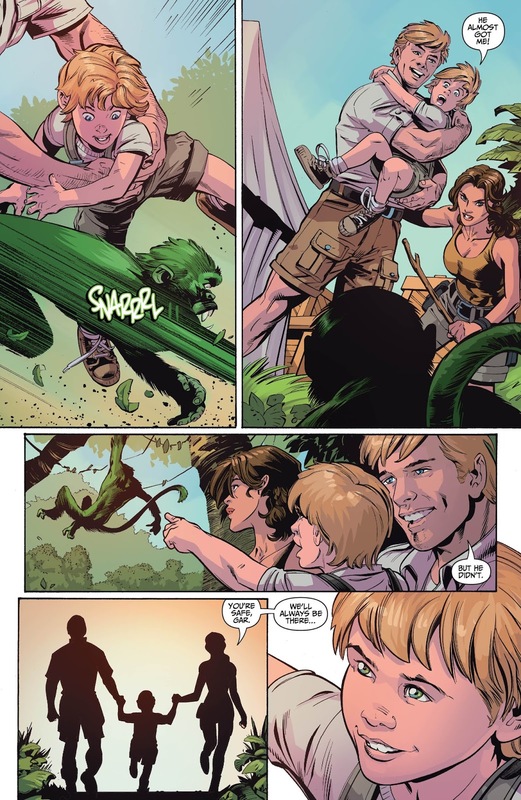 I mean, there was even that Dan Jurgens volume where (if legend is to be believed) he was forbidden from using Titans characters... in his Titans book! Even that felt more like the Teen Titans than this. I'll say this much... 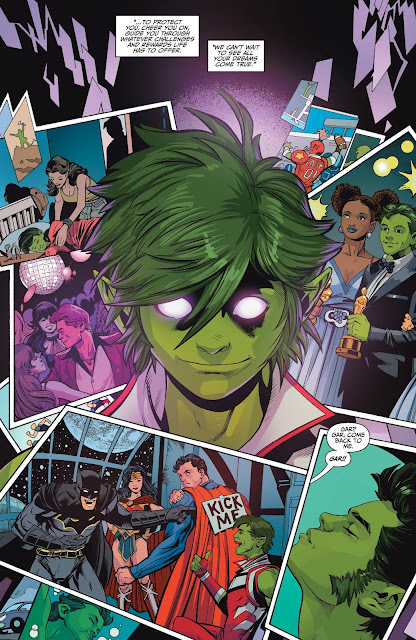 I didn't want to repeatedly punch Beast Boy in the face for this issue, and the art was very nice. Not great, not awful... just dull. A "lame duck" story just filling time until the next volume can begin.